Araceae - arum lily family Monocot. 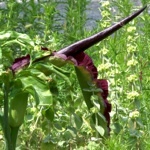 The very curious plant Dracunculus vulgaris, has a weird, rather sinister appearance and an unpleasant foetid smell and although this is transient, it has been described as one of the worst smelling flower in the world. These characteristics are reflected in various names given to the plant: dragon arum, voodoo lily and stinky lily. Because of its purple spotted stem and tendency to grow in places frequented by snakes and to disappear from them at about the same time, it is also called snake lily. The ancient physician, Dioscorides, recommended that carrying a portion of the root would protect against snake bite. Consistent with other plants in the same family, Araceae, it has an unusual structure. What appears to be a large purple, petal is the spathe, which surrounds almost black, long smooth protuberance, the spadix. The true flowers are hidden within the bulbous swelling at the base of the spathe; they are arranged in two ranks, the male flowers above the female flowers. The flowers emit a smell which attracts flies, these slide down the smooth, shiny surface of the spadix and are unable to clim out. Crawling around in the base of the flower, they transfer pollen from male to female flowers. Once the flowers have been fertilised the spathe begins to droop and then seed bearing fruits, which look like green and then red berries. * Confirmed by fellow amateur botanist Kjell Thovsen.